More then sixty Biorock© coral nursery structures have been installed since June 2000 in the Pemuteran Village Marine Protected Area in Northwest Bali, Indonesia, in cooperation with the Municipality of Pemuteran, Gahawisri (the Balinese Watersports Federation), local dive shops and hotels, and other local stakeholders. With a total length of 300 metres situated in an area of 2 hectares, this is the largest Biorock coral reef nursery and restoration project worldwide, exceeding the combined sizes of all other ongoing projects in the Pacific, Caribbean, and Indian Ocean. The project already has the majority of local coral species in cultivation. Their enhanced growth rate, reproduction, and resistance to environmental stress provides a critical reservoir of healthy corals to resist future hot periods caused by global warming and to restore damaged reefs and vital fishing areas. Bali’s coral reefs have been severely damaged in recent years due to use of bombs and cyanide by fishermen, excessively high water temperatures linked to global warming, and other stresses. The Pemuteran area is unique because no other part of Bali has such large areas of shallow reef, and these are accessible to divers and snorkellers because the region lacks the extremely strong currents and waves that characterize other coastal areas of Bali. However, Pemuteran reefs have suffered greatly from damage by destructive fishing because the low currents make it far easier for fishermen to retrieve fish killed by bombs or paralyzed by cyanide. Pemuteran village residents have taken action to prevent use of these destructive methods in their reefs, whether by locals or by outsiders. However, the amount of damage was so great that action was urgently needed to restore reef habitat for tourism and fisheries. 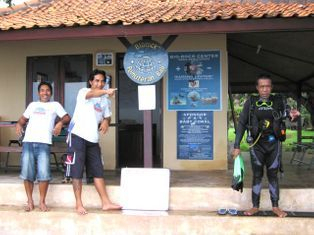 Because of mounting local concerns about reef deterioration, Yos Amerta, President of Gahawisri (the Bali Branch of the Indonesian Watersports Federation), invited Wolf Hilbertz and Tom Goreau to start restoration projects in Bali, following a workshop in coral reef restoration sponsored by Action Asia Magazine at the Asian Dive Exposition in Bangkok in May 2000. Coral nurseries built using the Electrolytic Mineral Accretion Technology (Biorock®) of Hilbertz and Goreau provide unique advantages for restoring coral reefs. Corals grown on mineral accretion are exceptionally brightly coloured and rapidly growing, support dense fish populations, and are more resistant to all environmental stresses except bombs and poisons. The first projects in Indonesia were built in the Pemuteran Marine Protected Area in June 2000 by Hilbertz and Goreau, working with Yos Amerta and Gahawisri, in front of the Yos Dive Shop at Pondok Sari, and in front of Reef Seen Aquatics. Three more structures were added in October 2000 in front of the Village Sea Temple, during an international training workshop on coral nursery construction (see Workshop Report for details). The Workshop was funded by a grant from the Leslie Jones Foundation to the Global Coral Reef Alliance’s coral reef restoration program, and donations in kind from Yos Dive Shop and Pondok Sari Hotel. The success of these structures in stimulating rapid coral growth was apparent within months, leading to requests to greatly expand the project. Taman Sari Hotel donated further funds to support the construction of new projects in March 2001. 18 new coral nursery structures were built and installed in March 2001 along the length of the Pemuteran Protected Area, in front of Taman Sari Hotel.) Six more structures were installed during the making of the Documentary “Reef Reborn-Into the Unseen World“ in April/May 2002, 3 of these structures were installed in front of Reef Seen Aquatics as well as a long mesh and wires directly attached to Corals. 25 more Structures were installed in the years of 2003, during BioRock Workshops January 2004 and November 2005 in front of Taman Sari Hotel and the Sea Temple. One more structure was added in March this year (2009).These structures are located in an area parallel to the shore, about 50-100 metres from the coastline, in waters ranging from about 3 to 7 metres deep. They are roughly lined up, forming a natural snorkelling and diving trail. Off shore Reef Seen Aquatics and the Reef Gardeners of Pemuteran installed another BioRock structure called Bio-Wreck followed by a structure in the form of a Turtle. The coral nursery structures are made of welded construction steel bars, mainly of 1 centimeter and 1.3 centimeter diameter. They are built in a variety of shapes, for example one structure, called the Nautilus, is 3.5 m high 3 m wide, and 11 m long, in the form of an ellipsoidal pyramid. Six structures, called the Flowers, consist of funnels of about 2.5 m high and 3-5 m diameter. These structures have numerous arc-like pockets along their sides. Another set of 7 structures, called the Caterpillars, are 12 m long, about 2 m wide and 2 m high, and consist of open downward and upward pointing arcs. Another project consists of mesh, 1.2 m wide and 25 m long, laid over the bottom. All structures are charged by power supplies located on the adjacent land. They are located in two enclosures at Taman Sari Hotel, in Bali Dive Academy, in the Pemuteran Village Barong Art Shop, in the Bio-Rock Center, in Werner Lau Dive Shop in Pondok Sari Hotel, and at Reef Seen Aquatics. Electricity is donated by the operators of these facilities. The cathodic structures and anodes are connected to the power supplies by cables which are buried in the beach and laid on the sea floor. Many structures receive power through several cables, and all are wired to each other so that power is shared throughout, allowing them to continue operating even if their direct power cables are severed. The power supplies are wired in parallel through common buses, so that if one fails the others will take up the load. As a result of this redundant design, the system is highly robust to failure of any particular cable or power supply. Because Bali lies close to the centre of the world’s coral reef species diversity, most of the world’s coral species are found in the Pemuteran area. Corals were collected for tranplantation onto the structures from sites in the Pemuteran area, including sites within the protected area and nearby fringing and offshore reefs. Corals were transported in large plastic buckets filled with seawater and attached to the structures as soon as possible. Most corals were simply wedged into specially designed spaces between the structural elements of the structures, and needed no further attachment. Other corals were attached by wires, or placed on or next to the structures. Coral selected for transplantation consisted almost entirely of naturally broken fragments that were found lying on reef slopes or buried in mud below them. Large numbers of corals were found loose, often having had their bases undermined by boring worms, clams, and sponges. Many of these corals were previously severely damaged by abrasion or burial, often with significant fractions dead. The purpose of choosing these damaged fragments was to rescue corals that would have almost surely soon died as the result of physical injury, and to avoid damaging healthy corals whenever possible. Often only a very small fraction of the coral was left alive as a result of previous injuries, but in almost all cases these living portions proceeded to grow well after attachment. A few totally dead corals were attached because some divers involved in collection were insufficiently experienced at identifying live corals. Although the focus was on stony reef-building corals, some soft corals, sponges, tunicates, and anemones were also transplanted. Because the naturally generated coral fragments most likely to be found by divers tended to be the most abundant branching corals (primarily Acroporas, Pocilloporas, Porites, and Seriatoporas) these species tended to be over-represented in the collected transplants. A special search was made for rarer coral species unlikely to be found as natural fragments, such as massive or encrusting corals. Where these could not be found loose, small fragments were broken off and transplanted to ensure that the maximum species diversity of the area was represented. These were often taken from colonies growing near to the structures. Some massive and cryptic encrusting corals found in the area were never found in sizes or shapes that could easily be broken off and transplanted, and are under-represented on the structures.